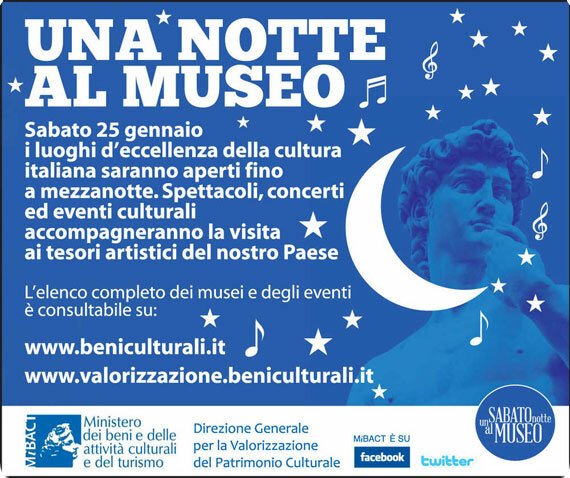 The Italian Ministry of National Heritage and Cultural Affairs and Tourism (MIBACT) this Saturday night January 25th repeats the initiative “A night at the Museum” and some state museums in the major cities in Italy will be open after the usual opening hours. In Florence this Saturday, you can then choose to spend the evening in 3 of the most important places of art of the town: the Uffizi Gallery, the Accademia Gallery and the Medici Chapels. You can book the entrance to museums by calling the phone number 055 294883. Enjoy a special Saturday surrounded by some of the most famous artworks in the world!